Time travel is a popular subject for scifi at least since The Time Machine, and it's having a bit of a mini revival recently. 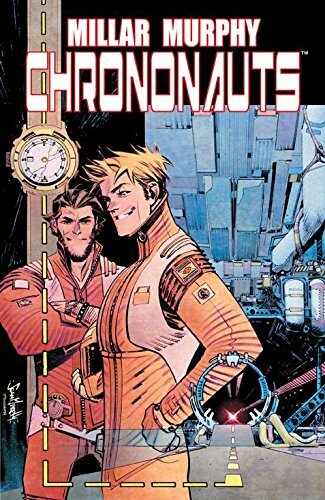 Usually, it's treated as a serious and important subject; Chrononauts doesn't do that. The four issues collected in this volume tell the story of Danny and Corbin, genius best friends who invent suits that allow them to travel through time and take whatever they're touching with them. Their tests are as public as the space shuttle launches, and are covered by world media as a major scientific event. But the first time a human—Corbin—goes through, something goes wrong, and he's lost in 1500s Samarkand. Danny goes to find him, lands four years after Corbin, and discovers that his friend has decided he's done with being reasonable and responsible. Corbin doesn't want to go home, and he's set himself up as king of the people there—and totally violated the timeline by bringing through weapons of war from all over time to help them defend themselves. After that, the story is a crazy romp through time for a while, building fortunes and living multiple lives, until people start noticing what's happening. Corbin is left without a suit, soldiers are sent after Danny and Corbin both, there's upheaval in the Samarkand kingdom, and there's a massive cross-time chase that ends in a huge cross-time army siege. It's amazing that so much story can fit into just four issues of a comic book. Chronocauts is paced at breakneck speed but somehow manages to also hit several character beats that make motivations more than clear and make the reader care about what happens to these two cocky and irreverent geniuses. The art is detailed and full of saturated color that works well with the many settings throughout time, from the age of dinosaurs up through the modern era. There's a feeling of fratboys on the loose at the beginning, but it's fun to watch since they have to pay for their bad behavior in the end, and that makes it a very satisfying read. Despite being about a subject that is often bogged down with science and technobabble, Millar and Murphy manage to tell a rollicking time travel story without more than the absolute bare minimum of exposition, and do it well in a small amount of space. And it's so much fun to read.